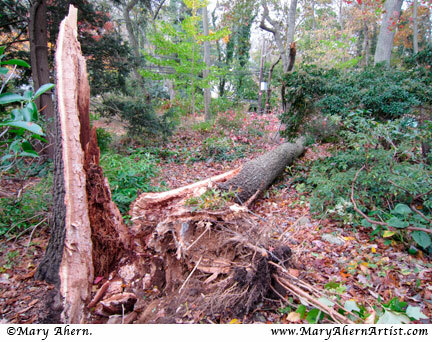 Recently I was asked about replanting trees after the destruction of Storm Sandy. I’ve given a lot of thought to this issue since my garden lost 4 large oaks which were living here before I moved into the shade they kindly provided me. We recommend that you do not re-plant using the following species of trees (all commonly planted in LI landscapes) that did not endure the storms well. Dogwood ‘Stellar Pink’ (this is one of the disease resistant Rutgers hybrids) 15-30’ ht & spread. Pink flowers in early summer. Stewartia pseudocamellia var. koreana. Quite slow growing 30’ht, 20’ spread. Decorative bark. White flowers in early summer. Single or multi-trunk. Heptacodium miconoides, Seven-son flower. (recommended by Katherine Tracey of Avant Gardens) 15-20’ ht by 8-10’ spread. Full sun. Bloom time:Sept.
For more particulars of each of these trees, don’t forget to search Google for more information to help you make the right investment choice for your own garden. For the past 25 years I’ve cultivated my woodland gardens. For the first decade I cleared the tangled woods, studied the indigenous plants, planned paths and materials. I worked on creating a natural looking shade garden focusing on the large oak trees and Kalmia that inhabited this spot of land before I showed up. A lot of thinking and sweat went into this garden. I selected what shrub trees, like the untold numbers of small cherries, that needed to be removed. Purged, or shall I say, paid someone to purge the thick growths of poison ivy. Fought and pulled, yanked and grunted bales and bales of ivy from the trees and ground in a continuing war for dominance. When the bones were clear I began to plant. The lists of shade tolerant shrubs and perennials read like a who’s who of my garden. Mistakes were made. Shade is not shade. Lessons learned. Successes were savored. Learning that gardening in shade reduces the need for weeding, plus you perspire less. Perfect! But Sandy decided she knew better and redesigned my garden. She blew in and knocked down three large oak trees and a beech thereby instantly transforming my beloved woodland shade garden into a sun-splashed mecca. Thousands of weeds instantly rejoiced by dancing in the new sunshine, prancing in the beds and mulched walkways. Ivy rebounded with a vengeance of superiority, eyeing triumph. Scores of broken and battered kalmia, enkianthus, leucothoe, rhodi’s, azaleas, viburnum, hammemelis, and andromeda wept. And now?? Lessons begin again. Looking for low-maintenance in the sunshine? Remembering our club trip to the Highline designed by Piet Oudorf, my Dutch hero, I’m creating new plant lists with sunshine in mind to cover the time for my new gingko to grow and spread. Shade my grandson will perhaps enjoy in case I miss it. Amsonia, salvia, achillea, aster, coreopsis, Echinacea, eremurus, liriope, persicaria, rudbeckia, sedum, helianthus, and grasses, yes many textures and heights of grasses. I’m excited now that my period of mourning has passed. Excited by all the new possibilities in the sunshine. My thermostat read 10° last night so when it’s that cold I tend to warm myself by planning what I will be doing this coming year in my garden. It is the calm before the storm. I like to read so with a hot cup of coffee and sometimes a blanket over my lap I settle down to a good book of how others tend their gardens seeking inspiration and camaraderie. I read new books but often I like to reread those of old friends I have in my library. Christopher Lloyd’s “The Well-Tempered Garden” is a perennial (hee hee) favorite. Other authors are: Dominique Browning, Joe Eck, Nancy Goodwin, Allen Lacy, Fred McGourty, Henry Mitchell and Vita Sackville-West. For more technical information and garden planning I read Michael Dirr for woody plants and Allan Armitage for perennials. If you’d like to replant a garden with a more natural look I read the work of Piet Oudolf, the Dutch plantsman. Reading Garden Blogs online are a path to many hours spent without realizing that spring is around the corner or dinner needs planning. I read a few regularly. Garden Rant is written by 5 different authors and covers amazing amounts of gardening, history and controversy. 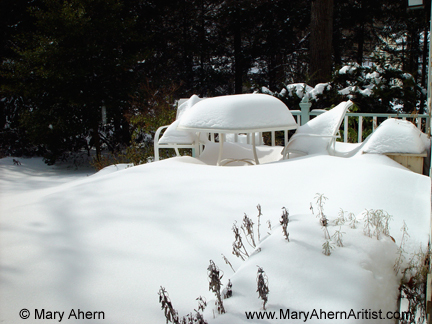 To give myself some ideas and recipes, I always turn to my favorite gardening blog written by Margaret Roach, A Way To Garden. Formerly a Newsday garden writer and the garden editor for Martha Stewart Living, Margaret has, among other wonderful advice, a monthly chore list, which is written for where she lives and gardens in zone 5. This is colder and therefore sometimes slightly later than we are here in our toasty zone 7. You can find this gem at http://awaytogarden.com. 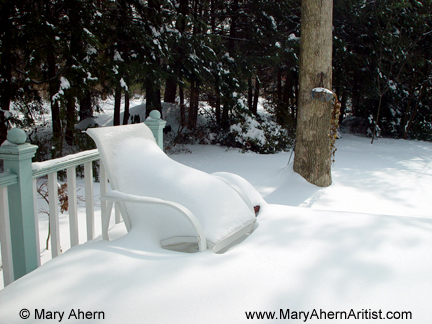 I was going to list all the various sources for gardening catalogs that will take over your budget and common sense but I’ll just post here Margaret Roach’s resource page, which says it all. Sit down, take a deep breath, rest, relax and learn, since before you know it we’ll be out digging holes again! Sandy came to visit and in a fury broke, smashed and tore away some of my garden friends. These huge and venerable trees were here before I moved into their space many decades ago. They’ve provided me with the backbones of my woodland garden. They helped me design the paths I carved out of the thickets. They offered the strong verticals of a towering garden design. These old oaks shared their shade keeping me cool in the summer. This shade offered me the opportunity to explore the great variety of plants and shrubs that thrive in their speckled light. Shredded oak leaves of these generous trees have been the basis of the garden mulch that nourishes my woodland garden. I am mourning the loss of what was. But now I’ve planted bulbs where the oaks once stood. I look forward in the spring to enjoying their sunshine. Step 15 of Rear Garden Design Project. So now that I measured the space, researched on the web, selected and took delivery of the bridge from GazeboCreations.com it is time to assemble the parts. Fortunately my son Michael gave me a Mother’s Day present of one day of labor. First he put together the base on the flat surface of the driveway. Then he put the struts across the dry stream bed and used a bubble level to make sure that it was even both front to back and side to side. This is a very critical stage to the entire project. Once the base is level and in place he attached the pre-drilled flooring in place. We used a thin nail as a spacer on each end of the boards to give some room for expansion as the boards swell with moisture. We attached the first board and then placed each successive board so we were sure of positioning before we attached them with screws. By this time my husband Dave came home and couldn’t keep himself away from the project so he joined Michael in putting up the side rails. Each part of the bridge kit was clearly marked and pre-drilled for easy installation. Nevertheless, the assembly took hours to complete. The second time would have been much shorter. My son Michael was pleased to have the project over and next year I’ll probably get a pot of marigolds for Mother’s Day. It will be much easier for him. My son Michael is happy the project is over. After 9 years of waiting I’m so very happy with the outcome of the project. The bridge is such a perfect complement to the natural feeling of the woodland walks I’ve designed. Step 14 of Rear Garden Design Project. I searched online to find a garden bridge to replace our nine-year-old “temporary” bridge and I found a good selection at: gazebocreations.com. I measured across the dry streambed to determine the length I needed to cross the span. The website had very good information about the span size and other stats I needed to make my selection. It was important to have a bridge that was the right scale for the project, a Goldilocks bridge, not too small, not too big, just right. I ordered it online with the added options of stainless steel screws and 2 Coats Cedar Stain/Sealer to ensure greater longevity. This bridge has to last a lot longer then the temporary one did. The boxes arrived by UPS and when I unpacked them I checked the parts list to make sure everything was there. It was complet I’m happy to say. We dismantled the “temporary” bridge that was always such a joy to the grandchildren on a day they weren’t visiting so the work went more smoothly. I thought I’d be nostalgic but I was far too happy to be finally getting a real garden bridge that I didn’t waste a moment dwelling on the past. Step 13 of Rear Garden Design Project. Now that I finally, after 9 years have my back entry stone walls and dry stream bed installed it is time for the decorating to begin. For all these years we’ve been using what was supposed to be a temporary bridge. In 2000, when we originally began this project the construction crew built a plank bridge by hammering a few weather treated boards together and putting them over the dry stream bed. My own grandsons have been born since the temporary bridge was originally installed and have grown up with the joy of bouncing wildly on the planks, much to the dismay of fathers, mothers and grandparents. Their utter joy in the flexibility of the boards and the semi dangerous and enthusiastic experience has provided untold hours of glee. I felt somewhat bad for them and wondered how they would react to the disappearance of their favorite playground. Fear not. They adapted instantly and have gone on to other adventures in the garden. I think they’ve found dinosaurs hiding along the woodland paths. Go To Step 14 – Selecting and Ordering the Garden Bridge. Step 12 of Rear Garden Design Project. I’ve been writing for awhile about the 10 year project of designing and building the rear entry project of stone walls, steps and a dry stream bed. We finally have our hardscaping done. Whew! This Taxus x media was in this location on the property when I moved in 20 years ago. During the 20 years that I’ve lived on this property so many of the trees and shrubs have grown, some have matured and some are in decline. I’ve been trimming a massive yew (Taxus x media), over and over each year to try to keep it contained within the scale of the property. Once the walls were installed and I began to enjoy the prospect of planting it became abundantly clear that the yew had outgrown its beauty and positive contribution to the garden. I gritted my teeth and ordered the removal of this venerable shrub since it was far too old and large for transplanting. I was quite saddened by the loss and yet I knew it was the right decision. The sun shined brightly on the day it was removed on March 12, 2009 and I could see immediately that the removal of this outsized and very dark green hulk opened up the space to new and youthful opportunities. Step 11 of Rear Garden Design Project. Our landscape project continued to move closer to completion when we finally hired professionals to finish the job we’d begun in the fall of 2000. In evaluating the project Billy Ahern of Ahern’s Landscaping, (who is not related to me in any way) decided to take down the walls I’d been trying to build on and off for many years. It is not because the walls I built were unsafe but because we wanted all the walls to match. This would not be the case if half was built by me and half by another person. We were very happy that the steps my husband Dave and I had built 6 years earlier were judged sturdy and stable and could be incorporated into the finished project. We were and still are proud of the achievement of having completed that part of the project. What took us years of off and on work, these professionals completed in two days. It was very clear to my husband and me that our careers of pushing keys on computer keyboards didn’t prepare us for the hard manual labor of hardscaping. We were no competition for the hardworking men who build these gorgeous projects day after day. We salute them and their work. Step 10 of Rear Garden Design Project. When we finally hired Billy Ahern of Ahern’s Landscaping to finish the project I designed and we started in 2000 he recommended some changes. I agreed with him that the scale of the dry stream bed that I’d designed was too large for the location. He had his men resculpt the walls and add soil. I’d been stockpiling extra soil that was taken from the driveway when I’d had it widened. The stream was narrowed and brought it into a good balance with the rest of the garden. He reused all the stone I’d dug up from the garden and the extra round river rock I’d purchased years before. His men put the river rock in the irregular flowing pattern I’d designed and they had nearly enough to complete the dry stream bed. But not quite. We scavenged rock from around the garden but we ended up having to purchase another batch of rock. What a surprise. More rock! What? More Stone? I’m afraid all this added weight might change the rotation of the earth. Once the rock walls were in place they put the gravel base in place and put small river rock on top. There is so much rock on this project I sometimes feel that the earth will give way from the weight. But that is just memories of my aching back. River rock was placed on the newly sculpted walls. It is so much easier to sign a check. I wouldn’t feel this way if I hadn’t worked on the project for so long and found that I’d bit off more then I could chew. So now I’m really happy to have help and to come closer to a completed design. Step 9 of Rear Garden Design Project. We jump ahead on the Rear Garden Design Project from 2002 until 2008. Sometimes life intervenes and projects get put on hold for a while. In the ensuing years I gained another grandson and he grew enough to join my first. They played on the piles of rock, some of which were walls. They particularly have enjoyed bouncing on the bridge planks giving all of us nervous twitches, but they never managed to get hurt. Bouncing on the boards and climbing on the stone. What fun! In 2008 I finally bit the bullet and called in the Pros. Billy Ahern of Ahern’s Landscaping in Huntington NY came to the rescue. (BTW. They are not relatives of mine, past or present) He understood immediately what I wanted to create and he worked from my original drawing plans. The first thing that Billy’s crew did was to dismantle the stone walls I’d built in fits and starts from 2002 through 2007. What took me days of laying one course of stone took the men seconds to undo. The crew dismantling my carefully and painfully built stone walls. It was quite dismaying and sad for me to watch the work I’d done disappear. I thought about the exhaustion and pain I’d experienced and all the trips to Nadine O’Neill my Chiropractor and The Pilates Place trying to get my self back in shape. And then I’d think with optimism how nice it was going to look and I would be able to go back to gardening, not construction work. I was also very pleased that Billy Ahern decided to keep the stone steps that my husband Dave and I had so proudly built in 2002. He said that were rock solid. We’re very proud. Step 8 of Rear Garden Design Project. We decided to trash my first idea of continuing the theme of the garden and using round river rock for the walls at the rear entrance to the guest room. What would happen each time it rained was that the soil would creep in from behind the stones and eventually clog up the passive drainage system. So I dismantled the walls, making a stack of rocks to the left of the door. Using my handy dandy Mantis tiller I excavated the base and leveled it smoothly. I used crushed bluestone to fill the base and give an even and strong working surface to the first base layer of stone. July 9, 2002 Spreading gravel is much harder then raking a lawn. I put landscapers cloth down first to keep back the soil and put the first course of stone down. This one is so critical because it sets the tone for the entire wall. I used levels to make sure the row was plumb. The work was so laborious that I could only work on one or two courses a day and then it would take me a day or two to recover. Thank goodness for my Chiropractor, Dr. Nadine O’Neill in Northport for keeping my aching body going. By the fall of 2002 I had to stop the project because I couldn’t fight the leaves everyday just to get started lifting stone. The project stood at a standstill for quite some time. Years in fact. Step 7 of Rear Garden Design Project. We’ve read lots of books on building stone walls and steps so we are fully armed with knowledge on how to proceed with our latest step in the project. We dug below the soil line, filled and leveled the base with gravel poured onto landscape fabric. Great beginning. We removed the temporary steps in preparation for the stone work. Note the pile of river rock piled against the back wall. We’ve begun dismantling the garden walls. We found the largest stones from amidst the three tons of stone we had delivered and started to put down our first step. We measured the height and width of the area and determined the riser and run dimensions of the steps making sure that they would all equal. This is a safety issue. My husband Dave quit stone work after we built the stairs and went back to computers. At the end of our first day we were proud of having completed our first step. We used levels to make sure the stones were sloped correctly and concrete dust to stabilize each step. So now that we had our first step the rest would be a cinch. Right? No beauty pageant winner here. I’m far to exhausted to care. Stair 2 has been completed. What we found is that we could only build one step a day. Sifting through the tons of stones, bringing them from the driveway using our handtruck. Shimmying them down to the base of the project and then lifting them into place. Absolutely exhausting work! I didn’t even commit a crime and I’ve been sentenced to hard labor on the rock pile. I should have been naughty. At the end of each day we took photos since we couldn’t believe how hard this project was for us physically. Oh, so you mean, working with computers all day doesn’t make you fit enough to haul huge stones? Who would have thought? The steps are done and I’ll never, ever build another set. Yippee! And so the day finally comes and we’ve finished the steps. We are still proud of them and thankful that we’ll never have to ever do something like that again in our entire lives!